...that we had an accident? Yup, our first day driving in Nairobi, and we run into another car on a roundabout. I have in the past experienced some crazy drivers, I spent 2.5 years in the maelstrom of Dubai's motorways, mixing it up with multiple different driving cultures, and even drove a minibus in India once, but never have I experienced drivers with such nerves of steel. Normally one look at our bull bars and people tend to back off, so slowly but surely elbowing your way across a junction tends to work (they even managed to intimidate Joburg minibus drivers, a notoriously rude lot), but here everyone plays chicken and we blinked too late. The result was a huge dent and scratch down the other car and a little bit of paint to be scraped off our bull bar. Shame (as they say with a smirk in South Africa)! 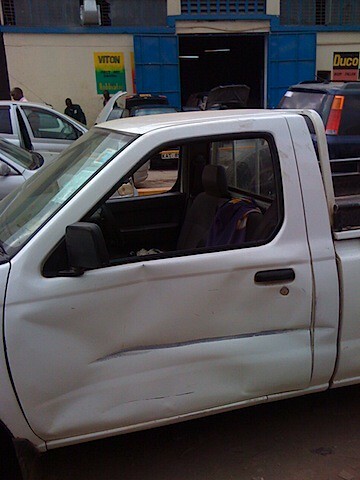 Since we are mzungu the traffic warden who didn't witness the accident took one look at us and decided it was our fault, not the guy who pushed his Nissan (not so) Hardbody into us in his desire to cut across in front of us. This meant sorting out a replacement for his damaged door. There followed 4 hours of tense negotiations (thanks, Fred!) in a backyard smelling of rotten fish (fertiliser factory) until we managed to negotiate the cost of a replacement door for an already dented, fertiliser-smelling wreck of a Nissan ute down from US$1000 to $70, which was a bit more realistic. We have been more respectful of African drivers since, mainly because we suspect that any damage will always be our fault, and as the t-shirt says: "This mzungu's ATM is out of order."